A modest sub-ohm tank with a host of great features! Sub-ohm tanks have taken the vape market by storm over the past two years. From monstrous octo-coil heads, to tanks with 7ml capacity and everything in between. Today, we take a look at a more modest entry level sub-tank from Sigelei – The Moonshot 120. Tanks have no doubt helped boost the smoker conversion rate. They’re often extremely easy to use, and require very little maintenance. Sigelei brought the Moonshot 120 to the table with beginners in mind – although many intermediate and advanced vapers (like myself) should find enjoyment in the tank’s simplistic design. How will the Moonshot stack up to its competition? The tank I tested for this review came along with the Sobra mod from Sigelei as a kit. Links for the kit can be found on the bottom of this post. The Moonshot definitely has simplicity working in its benefit, the three piece design is easy to assemble/disassemble, a breeze to clean, and really makes owning and maintaining one that much nicer. Big beefy o-rings kept a seal through multiple uses and nearly 50+ tanks full of e-liquid without giving me any issues. The bottom airflow slots were a breeze to adjust, and stayed exactly where I wanted them, allowing me to really dial things in. The single slot, located on the top of the tank, was the perfect size for both gorilla bottles and glass droppers. A screw on drip tip that doubles as a top cap stayed cool to the touch even after back to back 2-3 second pulls at 70watts, and was quite comfortable even after a few hours of vaping. Gets a bit loud at 80+ watts, thankfully the standard MS coil head is only rated for 80. Perhaps one of my biggest grips for the Moonshot was the quiet AFC adjustment. The slots work fine, and always stayed right where I set them, but having an audible confirmation would’ve really set the tank a cut above the rest. At 80+ watts the Moonshot did get pretty loud, especially with a tank half full of eliquid; thankfully, I found myself vaping at 60-65w the majority of the time. The drip tip was super comfortable to use, and always stayed cool to the touch – but it looked unfinished to me, almost as if it was added after the fact. I would’ve liked to have seen the slots on the top cap eliminated altogether; but that’s probably more of a nit-pick than an actual negative. The Moonshot 120 is going to be a great entry level tank for anyone new to vaping, and should work well for vapers looking to bring a straightforward sub-ohm in to their rotation. It performed flawlessly at 70 watts, had a smooth draw, and stayed very quite even with the airflow shutdown significantly. Honestly, I really had to scratch around to find the negatives I did. And even then, most of things I listed are rather ‘nit-picky’. There’s no one feature, or flaw of the Moonshot that would talk me out a purchase, or recommending one to a friend in the future. The tank retails for about $30 now, and you can pick the Sobra Kit from Sigelei up (with the Moonshot) for about $80. 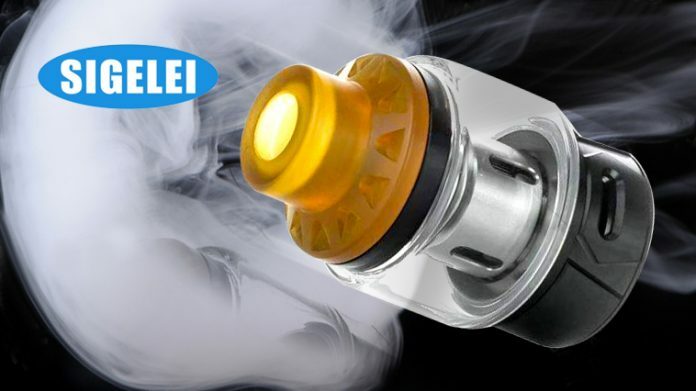 Whatever route you decide to take, I say go for it, Sigelei should not disappoint! Purchase the Sigelei Moonshot 120 here. Purchase the Sigelei Sobra Kit here. Previous articleDoes New CDC Vape Study Accurately Reflect Results?